Hi all! I've never raised chickens before, but I've been getting more and more serious about living a more sustainable lifestyle, providing for myself & my family. Chickens & a garden are my first step, after that, I don't know... Maybe goats? The girls are growing so fast, they look almost fully grown, even though they are still teenagers, so to speak. But they are so sweet, now that I stopped feeding them out of my hands. They started pecking at my hands everytime I reached for them 'cause they thought I had food. Silly birds. I've gotten them semi-trained to come when I say "Come on, ladies!" DH only has to make a disgusting sound with his mouth and they come RUNNING! So I call him my bird man, lol! We got those super heavy-duty pallets, took some of them apart and used others to create the frame. The ones we took apart become the walls and a roost. I'm putting it up on concrete blocks with a concrete floor so it will be predator resistant and cooler in the summer months, plus have some added thermal mass during winter. If I can get the windows & overhang the way I want, it will be shaded during the afternoon & evening in summer and sunny in winter. I've been successfully free-ranging the ladies for a good portion of the day. 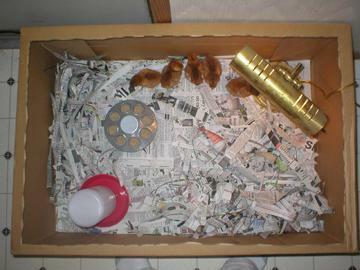 I know they are getting stir crazy in the large box I'm using until the coop is finished. I mean, it is huge, but still so much smaller than outdoors. I have tall weeds (strike that, I have tall edible plants!) and plenty of stuff they can run under if something flies over. I'm glad these girls have good instincts, they look to the sky if they see or hear any type of bird. If it looks big or predator-ish, they run for it. One cat is ever so tempted (the one that attacked my lady before) but any time he comes near them, one hen is calling the alarm and charging him, while the others huddle under my back steps! Good chickens! The other cat can eat right beside them and gets not a single notice. He learned from the other's lesson and doesn't do the stalk crawl at them. Wow these little girls are growing! Chipmunk too! 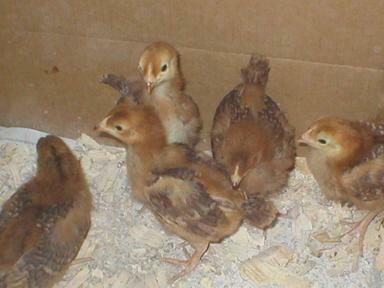 Looking at the pic below, I can barely tell they are the same chicks! I'll post some pics as soon as I'm able. Got a major start on a temporary tractor type thing. Its redneck engineering at its finest. Meaning it looks funky as heck, is cobbled together and will work FINE! Gotta love it. All I have to do this weekend is staple the netting on it. Gonna double it so there will be smaller holes for kitty cat paws to reach through. Had a bit of a scare last weekend, just before we were to go out of town. My daughter was watching the ladies while I washed dishes. Heard her screaming "Bad Cat! NOOooooo!" So I took off running. Thankfully, she scared the cat away. Little damage done to the lady. Doctored her up, separated her from the others until she started protesting. She's back with the flock now and I'm happy to say that no one but me can even tell which one it was now My DH: "They all look the same, how do you know thats the one that was hurt???" So I've figured out what I'm going to do for my coop. Since I have so many pallets available. I'm going to make the frames for the bottom, & sides out of pallets. Just nailed or screwed together. Was able to get a slightly rusty roll of poultry netting for FREE (free is gooood). I'll take that and surround the coop with it, between the pallet frame and the sheathing outside. Was able to scrounge a good deal of older exterior sheathing (the paint's all flaky, need to pressure wash), I'll cover the outside with that. The south wall will have a salvaged window from my mother's house to allow in sunlight & extra summer ventilation, and the Camper shell will overhang more on that side to prevent summer sun from cooking my birds. The camper shell will be spaced above the frame & sheathing, with the gap covered in hardware cloth or doubled poultry netting. I'll cover the floor with a scrap of roll flooring from my bathroom remodel. Its thick, tough, lays flat & isn't at all slippery. We can step right out of the tub onto the bare floor and still not slip. Plus it gives a little insulation. When I was digging in that dumpster, I found a big hunk of housewrap, emblazened with the logo of a local hardware store That will go between the pallet frame & the sheathing to help prevent drafts. Here are my girls at around 2.5-3 weeks and my new roo. Hopefully the lady I ran into at the feed store knows what she is talking about!!! Otherwise, I'll have another lady for yummy eggs. I guess we'll know in several weeks. 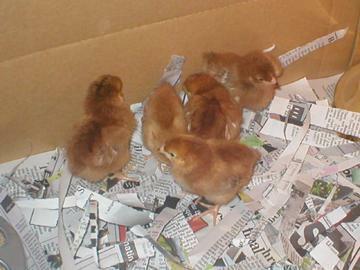 March 27th I picked up 5 Rhode Island Red pullets from a local feed store and brought them home. My 2 kids were instantly entranced. They love catching bugs for them and watching them "play football" as they chase around trying to take it away from each other. 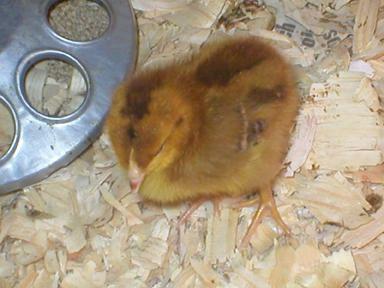 Its very warm where I put the chicks, so I just have a 100W bulb in that desk lamp, temps stayed right around where they are supposed to be.